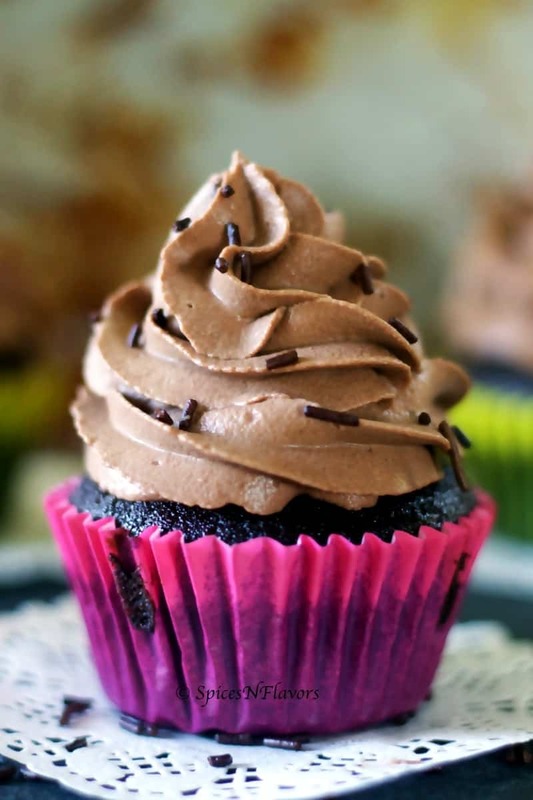 Chocolate Whipped Cream Frosting is the best chocolate frosting you could ever make!!! Light, Smooth, Airy, Sturdy and not so Sweet this frosting makes a great filling choice for cakes as well as use it to frost and ice the entire cake or decorate a cupcake. 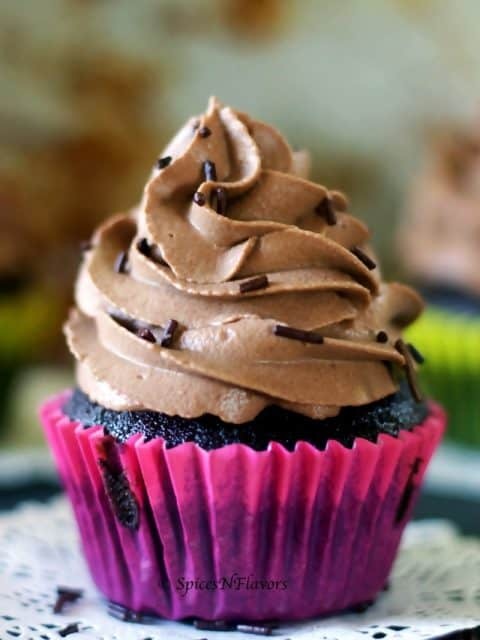 Chocolate Whipped Cream Frosting is a homemade chocolate frosting recipe that every home baker needs to know. 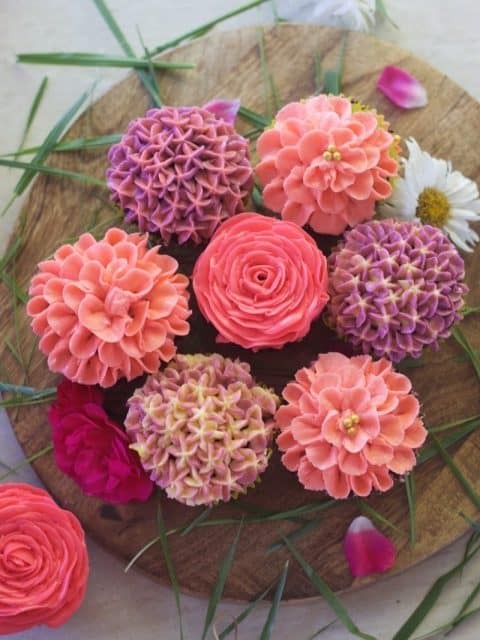 Not only a home baker if you ask me this is such a versatile frosting recipe that you can use to decorate a cupcake, cake, brownies or any other desserts – you name it and you can use this frosting and so I recommend anyone who loves baking or cooking should try this. 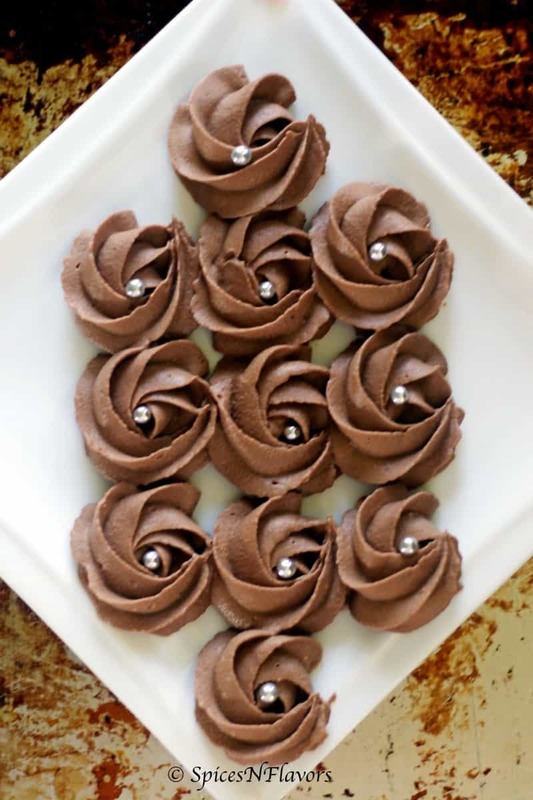 Wondering what makes this simple chocolate frosting recipe so special? Simple A. You need just 4 ingredients to make this delicious chocolate whipped cream frosting. B. Super easy and handy can be made in hardly any time say 5 to 10 mins. C. Not too sweet making it perfect for any desserts you can think off, even a simple hot chocolate with whipped cream would taste wonderful. D. Fuss-free and can be made in one single bowl. 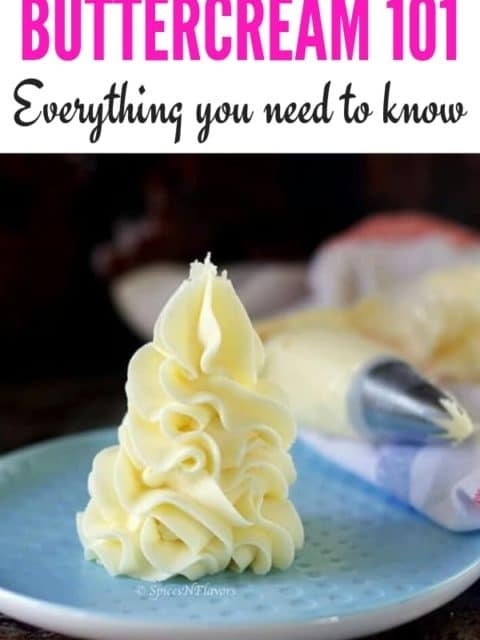 E. It is a sturdy whipped cream frosting making it perfect to frost and ice an entire cake or even to make decorations just like how a buttercream would work. Also, This is the frosting that, when there are leftovers, promptly gets used to top fresh fruit, pancakes, oatmeal…you get the idea right!!. It’s just that good. Coming to the sturdiness, what do you think makes it a stabilized whipped cream frosting? I guess some of you know the answer to it – Cream Cheese. You might have guessed it from my Stabilized Whipped Cream Frosting post that I had shared a couple of weeks back. That post has an in-depth detailing about the purpose of cream cheese in this recipe eventually making it the best chocolate cream cheese frosting. If you are someone who loves baking then definitely check that post. To be honest, if you are planning to make a cake with whipped cream frosting fresh and just for a family get together or something like that then you can also choose to skip the cream cheese in this recipe. Yes, I have shared a whole post on how to make an eggless chocolate cake with whipped cream frosting. That looks so gorgeous and professional and the best part is I have not used cream cheese at all in that recipe. Then why do we need to add Cream Cheese to our Chocolate Whipped Cream Frosting recipe? So the thing is cream cheese makes our icing look thicker and smoother and also glides well onto a cake, due to which making a smooth sharp edge becomes easier. Also, the main reason is stability; this chocolate whipped cream frosting holds its shape for days making it perfect if you had to make it for a commercial order. In what ways can I use this whipped chocolate frosting? 2. 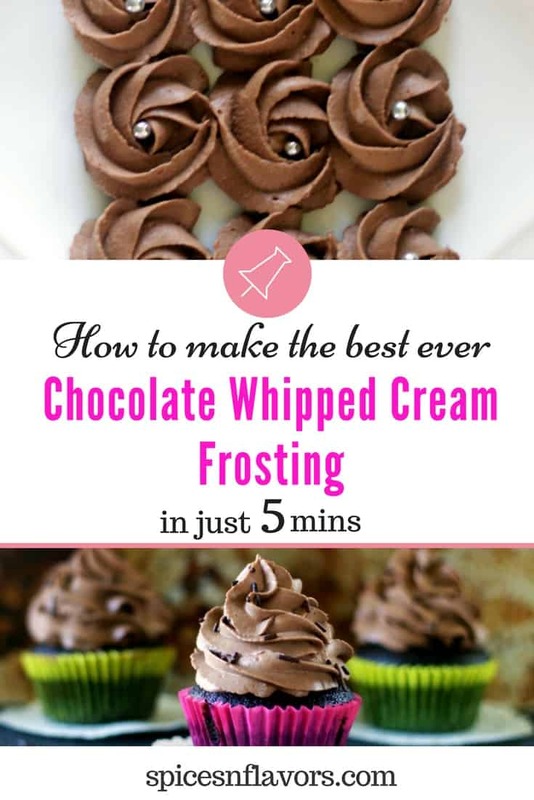 Make use of this Chocolate Whipped Cream Frosting for cupcakes like I have done and shared with you all in my previous post. 3. Use it to make an ice-box cake. 4. Replace the cream cheese with mascarpone cheese and use it while making Tiramisu. 5. You can also use it to top a pie, in hot cocoa (love hot chocolate with whipped cream) or use it as the filling in cookies sandwiches. Can I use the ready-made cool whip frosting instead? Yes, definitely you can use the store bought ones directly but hey nothing can beat the taste of homemade frosting right. That joy on your kid’s face when you bake, frost and decorate an entire cake all by yourself is impeccable. In my opinion, cocoa powder seemed to be the easiest and simple way of making this Chocolate Whipped Cream Frosting. One of the reasons why I love the original whipped cream frosting is that it can be made in one bowl. When we use cocoa to flavour it, there are no additional steps of melting chocolate and cooling it…etc. But if you are still looking for how to make chocolate whipped cream with melted chocolate then I found this recipe on the internet which seemed legit. I simply love whipped cream cake recipe, do share with me which is your favourite cake frosting? In a bowl, using a hand mixer cream the cream cheese until smooth and lump free. Whisking continuously add the whipping cream little by little until combined. Again whipping continuously add in the sugar little at a time. Finally add the cocoa powder and whip until stiff peaks. If you are someone who is worried about adding the cocoa powder directly on top of cream thinking that it won’t mix properly and you would get specks of it everywhere then I have an alternative for you. Dissolve the cocoa powder in 2 tbsp of cream to get a paste. And then follow the instructions till adding sugar and finally add this cocoa paste so that you are sure that everything is mixed well. Is it necessary to chill the mixing bowls and whisk attachment before whipping the cream? Hmmm, that’s a good question. In my 3 years of baking journey, I have never chilled the bowl and each time managed to get wonderful results. Then why do we always keep on hearing this? I guess it depends on what the weather is in your part of the world. Since it is super hot in India, you may be asked to go with that additional step but trust me I have never chilled it before. You had advised using Icing Sugar in your previous post then how come you have mentioned Caster Sugar in this Chocolate Whipped Cream Frosting? Honestly, I ran out of stock. Yes, that is the main reason why I used caster sugar here. Icing Sugar has cornstarch added to it so it actually helps in stabilizing the cream and that is the only reason why I recommend using Icing Sugar. Can I make this Chocolate Whipped Cream Frosting without cream cheese? Yes, definitely you can make it. Only thing is it won’t be as sturdy as this one and also it won’t hold its shape for a longer time. You can check out my chocolate cake post for a visual look on the frosting without cream cheese added to it. Undoubtedly this is one of the basic frosting recipes that every baker needs to know. Light, smooth, moist, airy, sturdy and not so sweet makes it an ideal frosting for cakes, cupcakes, brownies and any other dessert. Super simple and easy to make this Chocolate Whipped Cream Frosting comes together in hardly any time say around 10 mins. The addition of Cream Cheese helps it to hold its shape for days together. 2. Stabilized Whipped Cream Frosting. I hope you enjoyed this post and if you happen to try this frosting then do let me know by tagging me, tweeting me or instagram me. I would love to follow you and your posts. Can I make this using powdered sugar? Also can I make it wihout cocoa powder to make just regular stabalized whipped cream? 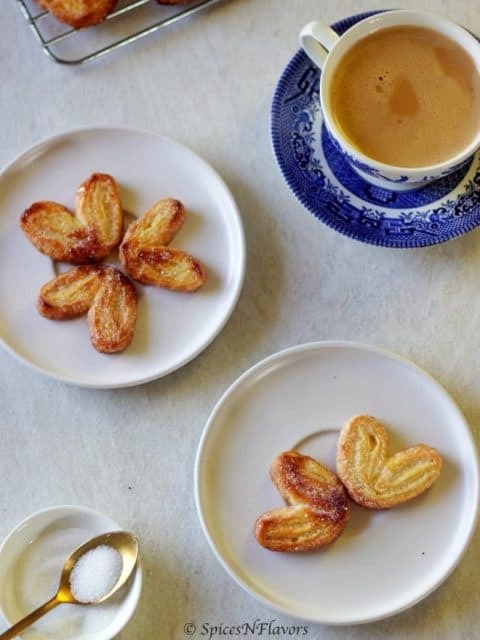 Wonderful recipe here but is there any way you can convert the measurements from grams to cups and teaspoons? I’m still learning about baking.